Two were high-risk to start, while one was a safer bet. Here's what you can learn to help you find the next millionaire-maker. 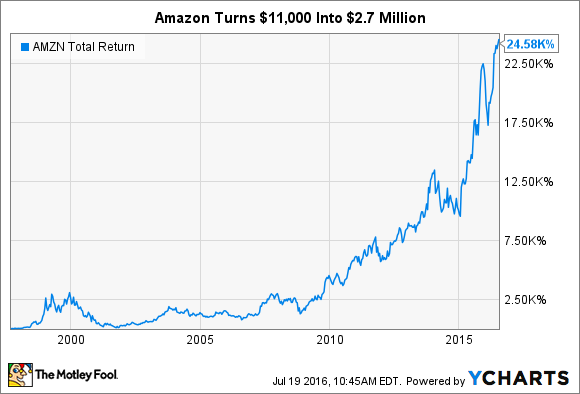 Imagine putting $10,000 down on one stock, then checking back in 20 years and seeing that it has grown to $1 million. Seems impossible, doesn't it? That's a 10,000% return on your investment. But it's not impossible. In fact, if you average a 26% return on an investment per year, you can accomplish this. However, that's much easier said than done. Below, we'll look at three very different companies -- e-commerce giant Amazon.com (NASDAQ:AMZN), cigarette maker Altria (NYSE:MO), and drug company Gilead Sciences (NASDAQ:GILD) -- to see how you could find a stock that could turn your $10,000 into $1 million. The Motley Fool's own David Gardner bought shares of Amazon in September 1997 for a split-adjusted $3.19. His original investment of $11,000 would be worth north of $2.7 million today. AMZN Total Return Price data by YCharts. A top dog and first mover in an important, emerging industry. There's no denying that e-commerce is one of the biggest shifts in the business world. A sustainable advantage gained through business momentum, patent protection, visionary leadership, or inept competitors. Amazon founder/CEO Jeff Bezos had a vision: to create the most customer-centric business on earth. And that's largely what he's done. Strong past price appreciation. When David bought shares in 1997, they had already gone up 65% during 1997 alone! Good management and smart backing. See No. 2. Strong consumer appeal. Even when it was only selling books, Amazon was a customer favorite. In fact, David tapped it because of his own positive experiences. Grossly overvalued according to the financial media. This was true back then, and it still is now. When David bought shares, he pointed out that many were calling the stock overvalued. It should be noted that this type of approach won't always lead to a 10,000% return in 20 years. In fact, the success rate may be very small. But the point is that all you need to do is catch one of these growth stories by the tail to become financially independent. If you ever check out a finance page to see what the day's biggest movers are, the most dramatic often come from drug companies. That's because FDA approval, positive clinical results, and a release of sales figures can be a binary event: either sending shares skyrocketing...or cratering. Back in 1995, Gilead was not a well-known name. But its stock started making serious moves after a number of important drugs gained FDA approval. 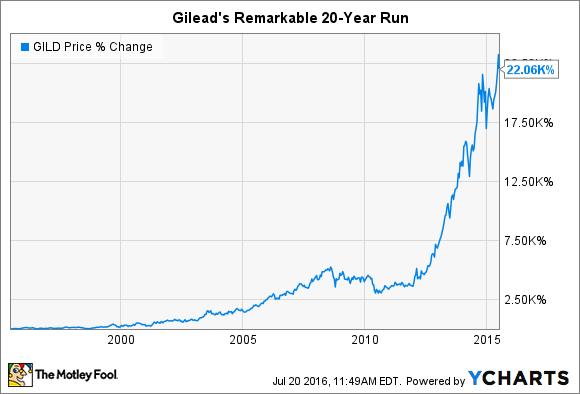 Gilead was able to use the proceeds from those drugs to do two very important things: reinvest in the company's R&D and acquire drugs that showed promise from smaller industry players. The most important developments of the past five years have been the release of HIV and hepatitis C drugs. It's worth noting that over the past year, Gilead shares are down over 25%. The company has had difficulty with its hepatitis C drugs, as it has had to cut prices due to competition. But such hiccups are normal, and should be expected, with drug companies. The lesson is that you should be looking for companies that are either looking to (1) solve major problems that affect a huge swath of our population -- and do it in ways that are measurably better than currently available, or (2) focus on rarer maladies that currently have no effective treatments. As with Amazon, it's important to note that success in pharmaceutical investing is hardly guaranteed. That's why due diligence and allocating a small portion of your portfolio to a basket of smaller drug companies is your best bet. Your downside is limited, but your upside has no cap. My favorite Fool writer, Morgan Housel, recently quipped that Altria's returns were one of the "most fascinating investing stories of the last 30 years." He's got a serious point. Consider that cigarette use has been declining for years now, governments have been cracking down on advertising, and almost every tobacco-pusher has a division devoted entirely to legal claims. And yet, in the past 20 years, here's how the world's largest cigarette maker has rewarded shareholders. But here's the funny thing: The chart above shows the "total price return." In other words, the 12,370% return over the past 20 years includes the effect of dividends. If we were to go simply based on the stock price, the return would fall all the way to 725%. 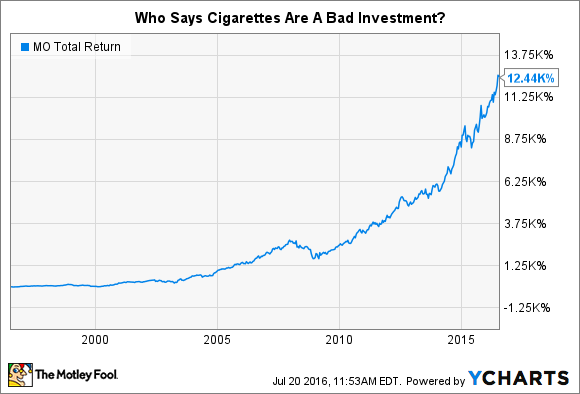 Altria investors in particular have actually benefited from the negative media surrounding cigarettes. Investors have been unwilling to pay up for Altria shares over the past 20 years. That has left the stock depressed, but the dividend yields have been outsized. That means that with each passing quarter, automatic dividend reinvestments have been able to purchase more and more shares. While it would be difficult to tell you what the next Altria might be, the takeaway lesson is clear: Dividends make a huge difference. And unlike the two previous methods for turning $10,000 into $1 million, there's usually far less risk involved. But perhaps the most important lesson is that you'll never be able to turn $10,000 into $1 million on a single investment unless you don't sell your shares. Patience is key, and being aware of whether your investment thesis has changed will help you keep a clear head after your shares have appreciated remarkably in value.